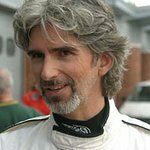 Formula One World Champion Damon Hill cycled 250 miles over the weekend (May 4-6) through cold and rain to take part in the Two Boats Cycle to raise money for the Halow Project. Hill, along with 40 fellow cyclists, set off from Putney Bridge, pedaled to Newhaven to catch the ferry to Dieppe, and cycled onwards to Pegasus bridge in Caen. After a brief pit-stop, they returned to the Channel, took a ferry to Portsmouth and cycled to the finish line at Guildford on Sunday afternoon. Hill – who is patron of the Halow Project – was joined on the ride by his son Josh, 21, and wife Georgie. The Two Boats Cycle has been organized to raise money for learning disability charity the Halo Project, which gives support to 16 to 35 year olds. The original goal was to raise £30,000 but the Formula One champ and friends smashed the goal and have raised close to £50,000.